I am writing this on a treadmill desk. Before owning it I used a standup desk for over a year. I believe that about 90% of people would be happier with a standing desk than with a sitting desk. In the future we will wonder why people sat for centuries when standing is a much more natural pose for humans. I believe that at least 25% of people would be happier with a treadmill desk than with a standing desk. Now, these numbers are pulled out of thin air, I have no data, but given these beliefs I figured I would try to help those 90% and 25% figure out who they are. I gave a talk in Stanford in 2011. The GSB's new building had adjustable height desks in every office; everyone I talked to loved working standing up. I figured I am like most Stanford faculty, or I would like to be, so I inferred I would like it too. I also thought that at libraries and when printing boarding passes at the airport I interact with a computer standing up and it never bothered me. So I decided to buy one. I wanted the option to be able to sit down if I was tired. After researching alternatives I bought an Ergotron Workfit S from Amazon for under $400. 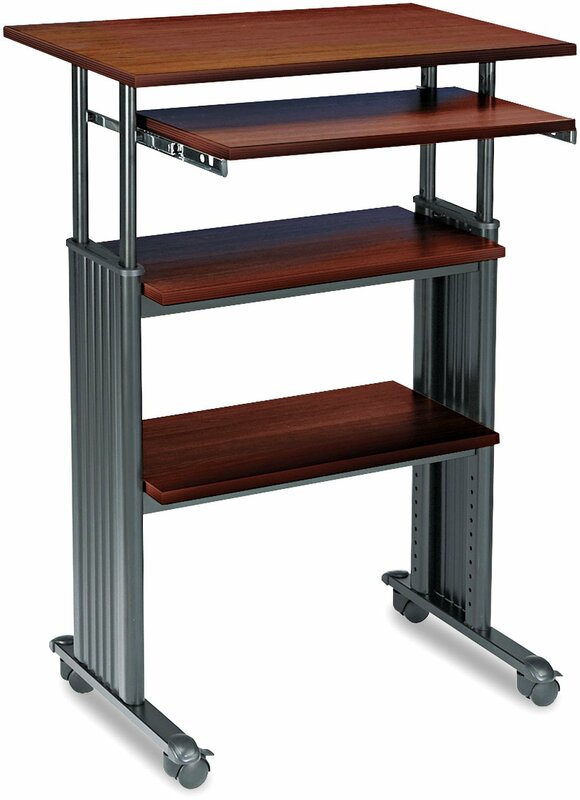 It is a desk addon that you put on top of any regular desk and allows working standing or sitting. You just pull it up and down with your hand as needed. It seems to be the best hybrid option out there. 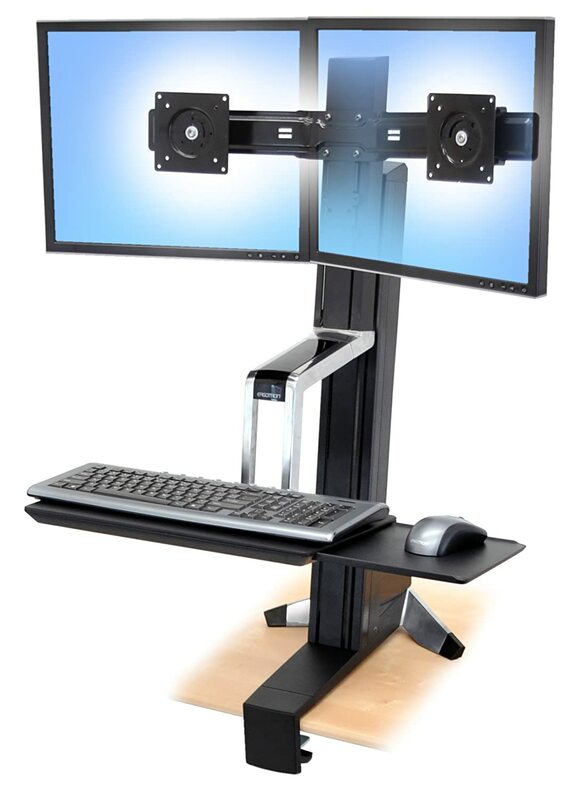 (others include the Kangoroo and pricier entire adjustable height desks; these are impractical if you need to keep your original office furniture as was my case). Once installed (takes about 30 minutes) you can go from sitting back to standing on your existing desk in about 5 seconds, and back to sitting in another 5 seconds. I loved standing in general, loved it. I only liked the Ergotron. - Some vibration of monitors as you type (this does not bother most people, but it did bother me). If I had not moved on to a treadmill, and were to simply use a standup desk, I would replace the Ergotron. 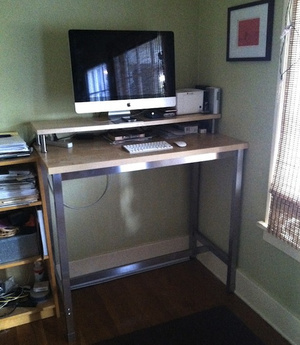 Instead of an adjustable height desk, I would have an always standing desk next to my regular desk. I have that with my treadmill, just added a third monitor in front of a chair and I use a wireless keyboard+mouse that I moved back and forth as needed. I have a standing and a sitting working areas. This setup would work in all but the smallest of working areas (probably not in a cubicle, there you need the addon). Amazon offers this standing desk (I use it at home, set up in minutes, sturdy, comfortable, but a bit pricey for what it is). 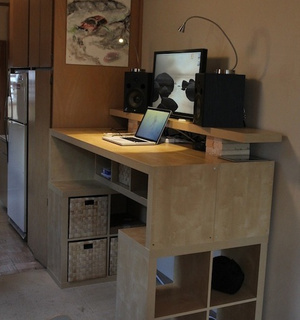 If money is no issue, you can buy desks for up to $4k. Doesn't it look kinda ridiculous? Yes, a little bit. It is not a fashion statement (or rather, a statement that you don't much care about fashion). I spend about 3 hours a day walking (I've had it for a 1 month). Another 2 hours I stand without walking (I stand on the treadmill). About 30 minutes sitting, and the rest of the time on coffee-breaks, lunch, meetings, etc. What can you do and cannot do while walking? I do almost everything on the treadmill (e.g., this document). Keyboard and mouse use are not at all impacted (it is surprising, but true; but i do use a trackball, not a mouse, some say mouse is a bit impacted). I can read and write research papers 0 problem. I can program routine stats stuff (STATA, SAS, R). I can set up slides. For heavy duty thinking about mathy stuff I turn the treadmill off (say, to derive a formula, or set up a new algorithm). Like most treadmill desk users, I walk at about 2.5 mph. 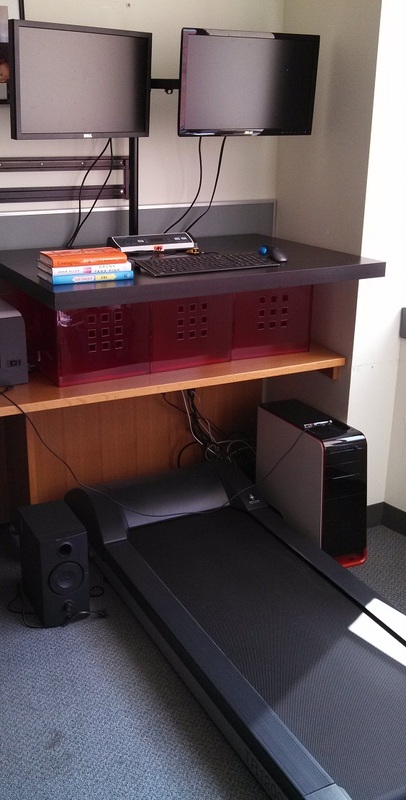 A friend told me about his treadmill desk and I thought it was crazy. But when I had to stop biking to work I wanted an alternative to exercise with 0 marginal time cost, and gave it a try. I was used to it by the 3rd day. I absolutely love it now. I burn more calories now in my office than I used to in my 6 mile each way bike commute. I am arguably less likely to be hit by a Honda Accord now (I am OK, at least it was not raining). I bought an expensive treadmill marketed to be used under a desk, thinking that if I tried and did not like it I wanted to make sure I had given it its best shot. I bought for nearly $1k the LifespanTR-1200 DT3 ; they are a well known brand of treadmill makers and supposedly this one is designed to withstand being on for hours on low speed and to be quiet (I went to a local Leisure Fitness to give it a look and try before buying -I bought online but only because they were out of stock). The TR-1200 It is indeed really quiet, makes less noise than the laser printer on the hallway I can hear right now. You cannot hear my treadmill from oustide my office with the door open. I understand that cheaper treadmills are louder, don't know for sure. There are two versions of the TR-1200: with and without desk. 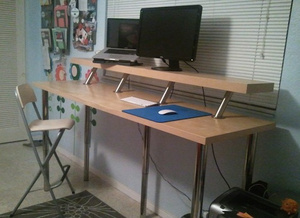 The one with desk ( DT5) is $1500. Note: Before making this addon I figured out the dimensions i needed by experimenting with a flat surface that i raised and lowered using book stacks. I almost bought this $250 regular treadmill which many have taken the front end apart to use under a desk. Info on this option here, here and here . 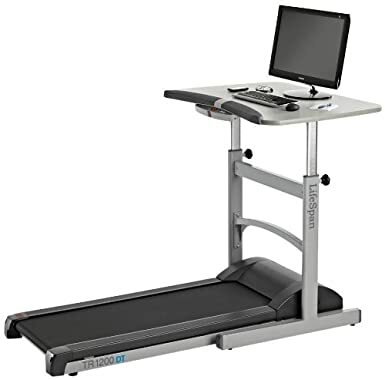 Or read Amazon reviews for this treadmill that include the word desk on them The main downsides are that it will be louder, and takes more setup costs, but probably not that much. Too late I learnt of this cheaper Lifespan TD-800, it seems that the only difference is that it is a bit shorter, I do have a foot to spare in mine so I would give the 800 serious thought (though I am 5'10, if you are reading this in Europe or after dunking a basketball you may need the 1200) The 800 is $800.